Insidious Workplace Behavior (IWB) refers to low-level, pervasive acts of deviance directed at individual or organizational targets. Because of its inherently stealthy nature, scientists have paid little attention to IWB, allowing us to know very little about it. With this book, that now is changing. The present volume - the first to showcase this topic - presents original essays by top organizational scientists who share the most current thinking about IWB. Contributors examine, for example, the many forms that IWB takes, focusing on its antecedents, consequences, and moderators. They also highlight ways that organizational leaders can manage and constrain IWB so as to attenuate its adverse effects. And to promote both theory and practice in IWB, contributors also discuss the special problems associated with researching IWB and strategies for overcoming them. Aimed at students, scholars, and practitioners in the organizational sciences - especially industrial-organizational psychology, organizational behavior, and human resource management - this seminal volume promises to inspire research and practice for years to come. Part 1. Introduction. M.S. Edwards, J. Greenberg, What is Insidious Workplace Behavior? Part 2. Forms of Insidious Workplace Behavior. J.H. Neuman, L. Keashly, Means, Motive Opportunity and Aggressive Workplace Behavior. M.A. Seabright, M.L. Ambrose, M. Schminke, Two Images of Workplace Sabotage. D.A. Jones, Getting Even for Interpersonal Mistreatment in the Workplace: Triggers of Revenge Motives and Behavior. C.M. Pearson, Research on Workplace Incivility and its Connection to Practice. C. Fitzgerald Boxer, T.E. Ford, Sexist Humor in the Workplace: A Case of Subtle Harassment. S.L. Glover, Lying to Bosses, Subordinates, Peers and the Outside World: Motivations and Consequences. Part 3. Methodological Issues. S.M. Jex, J.L. Burnfield Geimer, O. Clark, A.M. Guidroz, J.E. Yugo, Challenges and Recommendations in the Measurement of Workplace Incivility. P.E. Spector, O.B. Rodopman, Methodological Issues in Studying Insidious Workplace Behavior. Part 4. Integration. M.S. 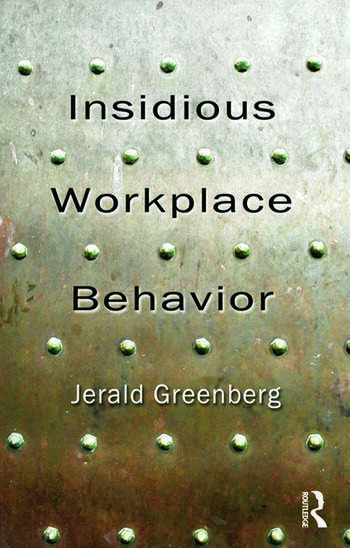 Edwards, J. Greenberg, Issues and Challenges in Studying Insidious Workplace Behavior. Jerald Greenberg is Senior Psychologist at the RAND Corporation’s Institute for Civil Justice and is retired as Abramowitz Professor of Business Ethics at Ohio State University’s Fisher College of Business. He has served as Associate Editor of Organizational Behavior and Human Decision Processes and of the Journal of Organizational Behavior. In addition to 25 books, Greenberg has published over 150 articles and chapters, most in the field he helped develop, organizational justice. Recognizing a lifetime of research accomplishments, Greenberg he has won the "Distinguished Scientific Contributions to Management Award" granted in 2007 by the Academy of Management, the "Distinguished Scientific Achievement Award" granted in 2006 by the Society for Industrial and Organizational Psychology (SIOP), and the "Herbert Heneman Career Achievement Award" granted by the Human Resources Division of the Academy of Management granted in 2005. Based on citation counts, Dr. Greenberg has been identified as the 37th most influential management scholar (Podsakoff et al., 2008).